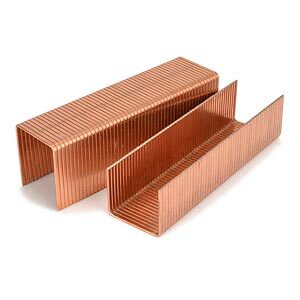 SW9060 type carton staples for triple wall corrugated boxes, Liquor Finish (Copper). Salco brand, interchangeable with Bostitch SW9060 staples. 12,000 (12M) staples per carton. Fit Salco TW-32, TW-38, Salco LJ, ISM Giant Staplers. SW9060 type staples, 1-1/8” length, LF. 12,000/carton. Salco brand. SW9060 type staples, 1-1/4” length, LF. 12,000/carton. Salco brand. SW9060 type staples, 1-3/8” length, LF. 12,000/carton. Salco brand.